The city of San Diego, in southern California, on the Mexican border, is well-known for its ideal weather. Because of this, its beaches, and its world-class attractions, it is a popular destination for travelers from all over the world. The city possesses a wonderful blend of old and new and will occupy tourists for at least several days. However, the city is somewhat sprawling so a single walking tour would be too long and time-consuming. Thus, I have prepared two separate walks which address the two most popular areas of the city. 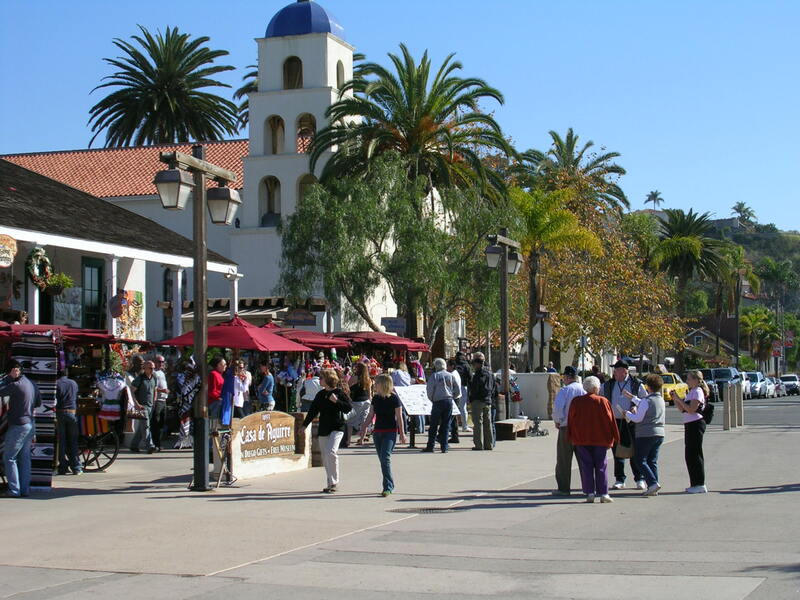 This walk begins at San Diego’s #1 attraction, the San Diego Zoo, one of the best zoos in the world. 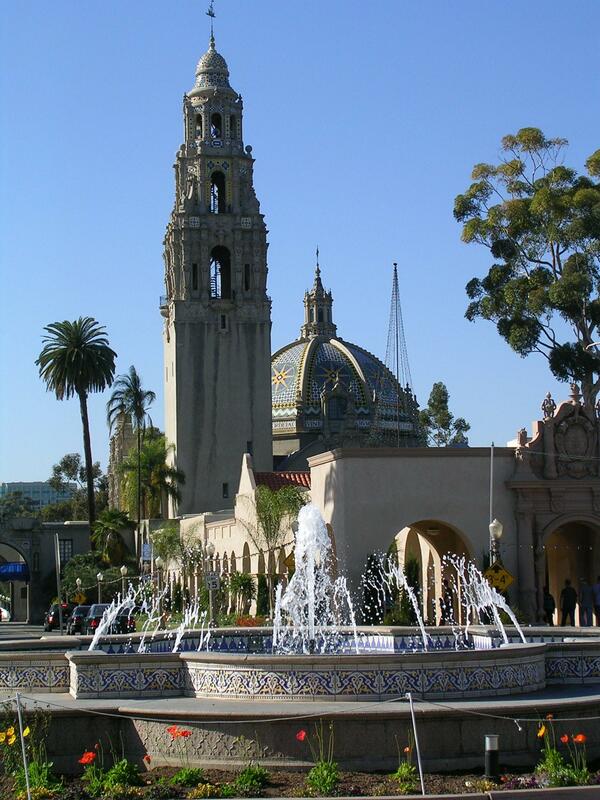 It is in the far northern part of Balboa Park, the huge urban park that is a Mecca for locals and tourists alike. 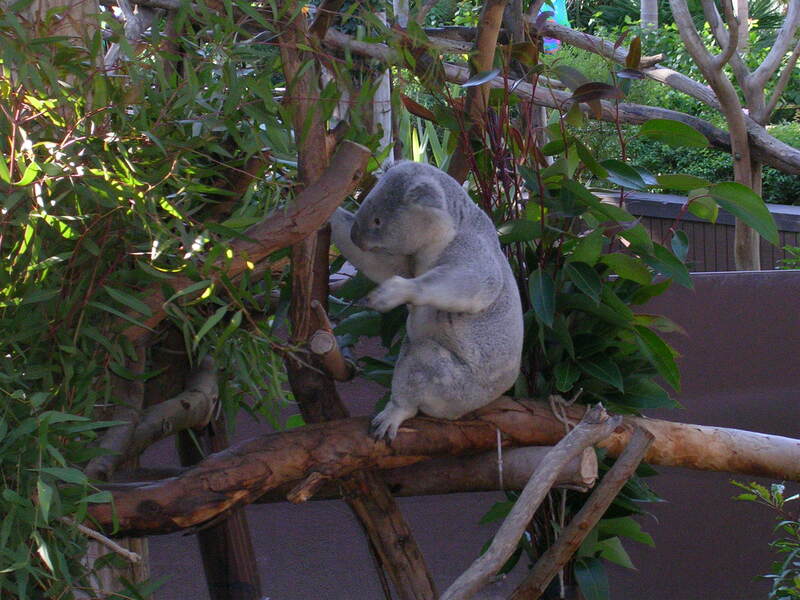 The zoo has an incredibly diverse collection of animals, including Koala Bears from Australia and Giant Pandas from China. The zoo itself involves much walking although there are trams that can save some wear-and-tear on your feet. From the zoo, head south from the exit, past the Spanish Village Art Center, which is basically a series of shops. 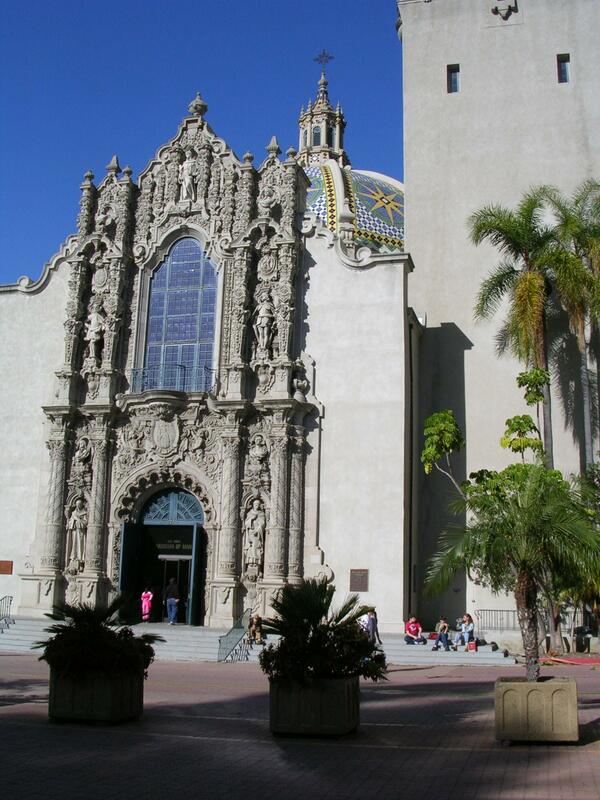 South of the Art Center is the San Diego Natural History Museum which has numerous exhibits specializing in the wildlife of the Southwestern United States. After the museum, turn left and then immediately right on El Prado, a beautifully-landscaped Spanish walkway. Kids will love the San Diego Model Railroad Museum on the left. 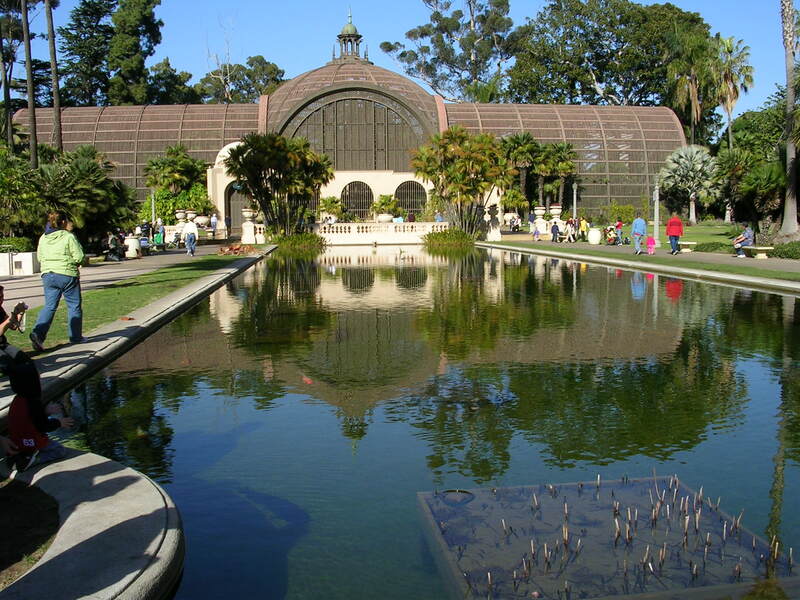 On your right, just after the Junior Theater and set back off the road beyond the Lily Pond is the Botanical Building which displays thousands of exotic plants, including a carnivorous plant bog. Art lovers will enjoy the Timken Museum of Art, on El Prado, just beyond the Botanical Building, and the San Diego Museum of Art, just beyond that, on the Plaza de Panama, a beautiful square. Continuing west on El Prado, the Alcazar Garden is on the left, and the San Diego Museum of Man is on the right, with outstanding anthropology exhibits from Egyptian mummies to Native American inhabitants of the Southwest US. From here, reverse direction and head east to the Plaza. Turn right here and work your way south. On the left is the Casa del Rey Moro Garden, then the Japanese Friendship Garden, a delight to stroll through. Continue south and eventually you will reach the Pan American Plaza. On your right is the San Diego Automotive Museum which displays cars and motorcycles from around the world. Across the plaza is the San Diego Hall of Champions Sports Museum, the perfect venue for the sports fan. Now, head west on Presidio Way to Park Boulevard and take a left, heading northward. Check out the Veteran’s Memorial Garden, on your right, and then continue north. Your next stop might be the Reuben H Fleet Science Center, with numerous hands-on exhibits involving science, technology, and mathematics. Further north are the Inez Grant Parker Memorial Rose Garden and the Desert Garden, both on the right hand side of the road and both interesting to explore. When finished, continue up the road and just past the Carousel, take Zoo Place left which returns you to the starting point of the walking tour. Note: this walk with many stops is at least one full day, but, more appropriately, several days, so adjust your schedule according to the amount of time you have in town. Old Town San Diego State Historic Park is an admirable attempt to preserve some historic buildings and adobe homes from San Diego’s original settlement, in the mid-19th century. This walk begins at Plaza del Pasado, a very attractive and colorful square featuring a beautiful fountain surrounded by restaurants and shops. The floral displays are particularly enchanting. It is located in the northwestern corner of the Old Town, at the junction of Wallace Street and Juan Street, where some parking is available. From the plaza, take Calhoun Street south. Check out the Casa de Estudillo on your right and Seeley Stables, on your left. Take a right on Twiggs Street at the southern end of Old Town Square, a broad expanse of grass which is a popular gathering place. Turn right again onto San Diego Avenue. Ahead on your left are a number of interesting stops. First is the Courthouse, then a bit further north is the Wells Fargo Museum/Colorado House, and several doors further down the street is Casa Machado-Silvas. At the end of the road is the Robinson Rose House, a two-storey adobe house built in 1853, which now houses Park Headquarters. Stop in for a map and information before proceeding. Now turn left and follow Congress Street which features Casa Machado Stewart, which provides a glimpse of early San Diego life, circa 1830. Turn left on Mason Street to the see the Mason Street School, the town’s first schoolhouse. When you reach San Diego Avenue, turn right. The Immaculate Conception Church is on your left. As you continue walking south, just past the intersection with Harney Street, the Whaley House, considered the oldest two-storey brick house in Southern California, will pique your interest. After the visit, proceed southward to Conde Street and turn right. The Old Adobe Chapel is on your left, a classic early-period church in this region. After a short visit, retrace your steps back to San Diego Ave and turn left. Then turn right at Twiggs Street and left on Calhoun Street. This time, check out Casa Bandini, another house of this time, on your right, and, behind it, the Blacksmith Shop, where demonstrations are occasionally held. Continue straight to return to the Plaza del Pasado where you began your walk..